Tooth decay is caused by destructive bacteria forming on the chewing surfaces of your teeth. Preventing decay completely requires more than regular brushing and flossing alone can provide. To protect teeth, Dr. Louis Olberding recommends sealants, a wonderful advancement in preventive dentistry. Sealants are synthetic compounds applied to tooth surfaces as a protective barrier. Like a security system for your mouth, they physically protect teeth from harmful bacteria. If bacteria can’t get to your teeth, they can't cause decay. As a family and general dentist in Lincoln, Dr. Olberding understands how children gravitate toward sugary foods and are often less particular about brushing and flossing. 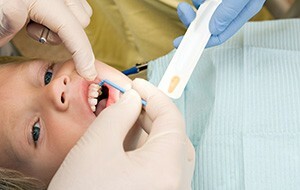 At Olberding Dental, we advocate the beneficial application of dental sealants in children. Think of what it could mean for your child – fewer or possibly even no cavities at all! Children aren’t the only ones who can benefit from sealants. In certain cases, adults may also benefit from them. This is especially true if cavities tend to form on the surfaces of back teeth. Sealants are painless, affordable, and easy to touch-up during routine visits. Find out if dental sealants are the right choice for your family. Call us today to schedule your next visit. Whether you’re looking for general, cosmetic, or restorative care, you can count on us to provide service that exceeds your expectations. We will help you get to the root of your oral health problems so you can enjoy better comfort and functionality.